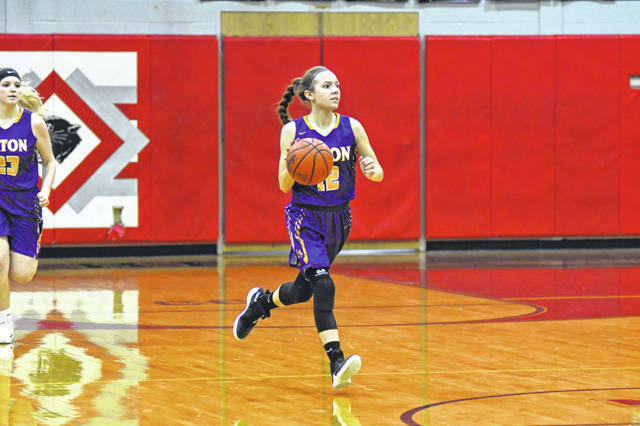 Eaton sophomore Kylee Kidwell brings the ball up court during the Eagles basketball game at Tri-County North on Monday, Feb. 4. Eaton pulled away in the second half for a 56-35 win. 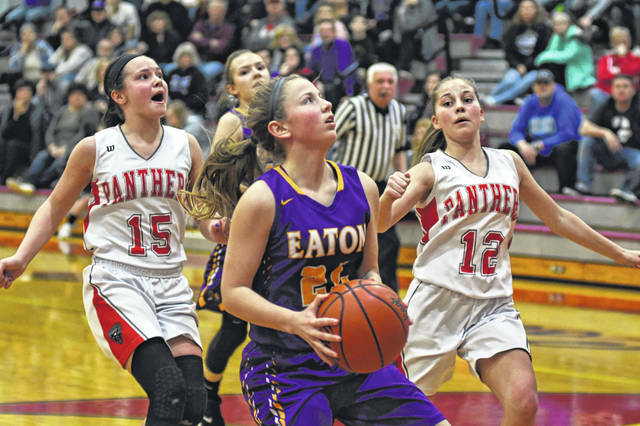 EATON — Eaton’s girls basketball team got a much needed win over county rival Tri-County North on Monday, Feb. 4 to snap a six-game losing skid. 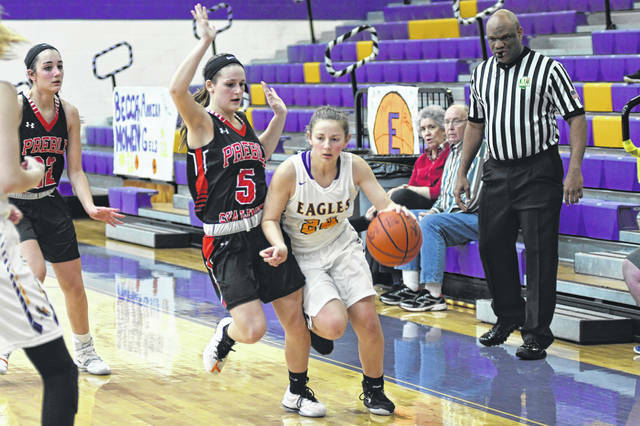 The Eagles nearly kept the momentum going a few nights later against another county foe — Preble Shawnee. But let a 19-point halftime lead get away and suffered a 50-45 loss in overtime. 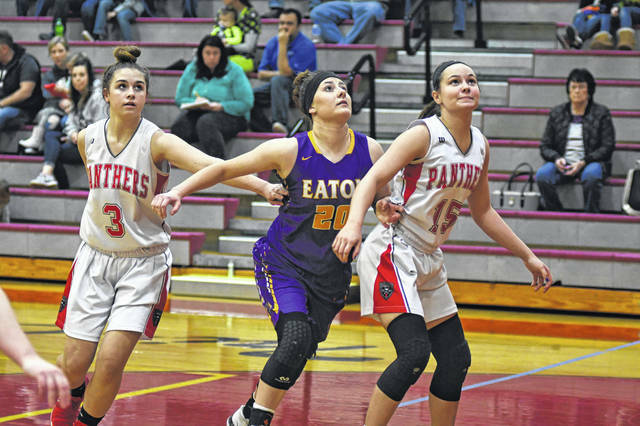 Eaton, which has fallen on hard times of late, is now 7-14 overall and 2-9 in the Southwestern Buckeye League Southwestern Division. They have dropped seven out of their last eight contests. Eaton held a 13-6 lead after the first quarter, but North kept the game close cutting the Eagles lead to 26-22 by halftime. Eaton extended its lead to 42-29 after three, before pulling away in the fourth. 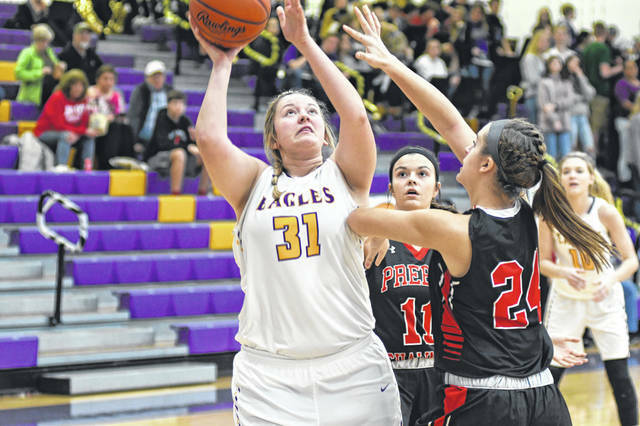 Against Preble Shawnee, on Thursday, the Eagles looked to be riding the momentum and emotions of Senior Night as they raced out to a 14-2 lead, scoring 12 straight points after the game was tied 2-2. 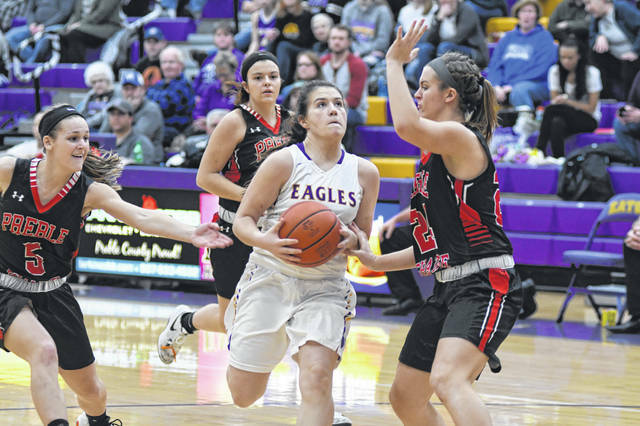 The momentum carried over into the second quarter as the Eagles limited the Arrows to just three points and extended their lead to 27-8 at halftime. Shawnee, though, turned up the defensive pressure in the second half and closed to within 31-27 after three. 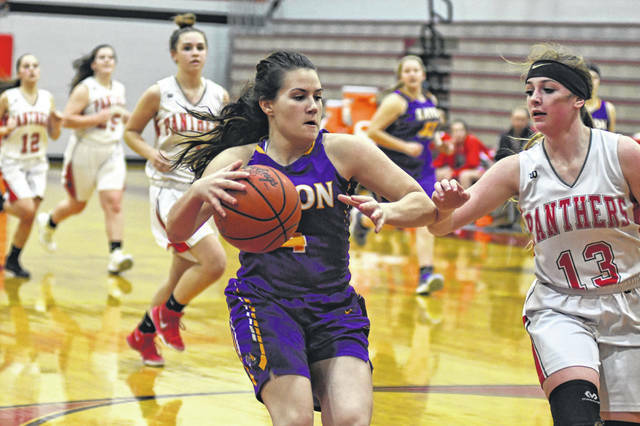 Eaton held a 40-37 lead with late in the fourth, but the Arrows banked in a 3-pointer with 11 seconds left to force overtime. 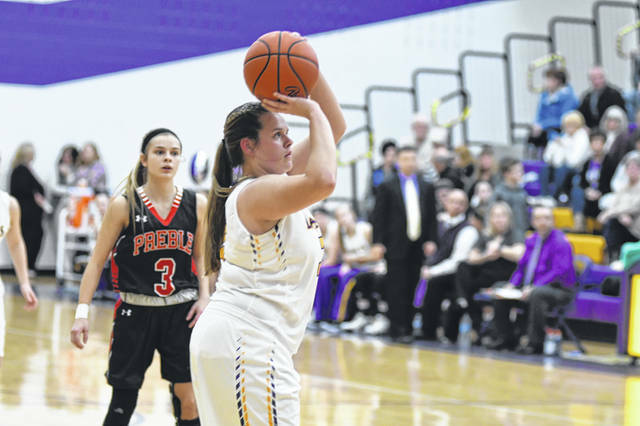 In the overtime, the lead changes hands four times before the Arrows pulled away for the win. As well as everything went in the first half, it went nearly as bad in the second half. After Shawnee took its first lead of the game at 35-34, Eaton appeared to regain control. The teams traded the lead four times in the overtime period before Shawnee took control. Shepherd led the Eagles with 12 points and 10 rebounds. Lexi Miller tossed in 11 and had five rebounds. 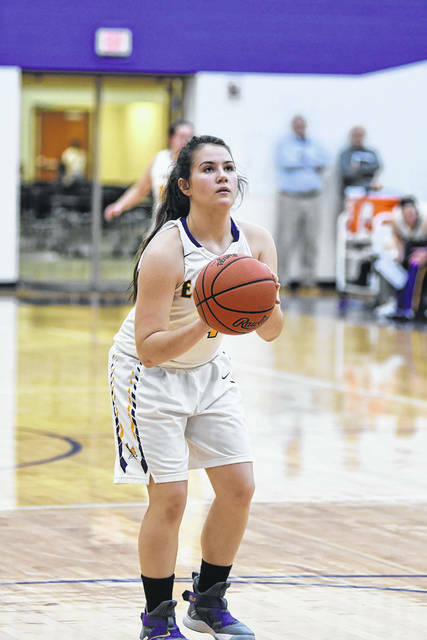 Gels added nine points, six rebound and three assists. Becca Mowen grabbed nine rebounds. Honhart said his team bounced back on Friday during practice. 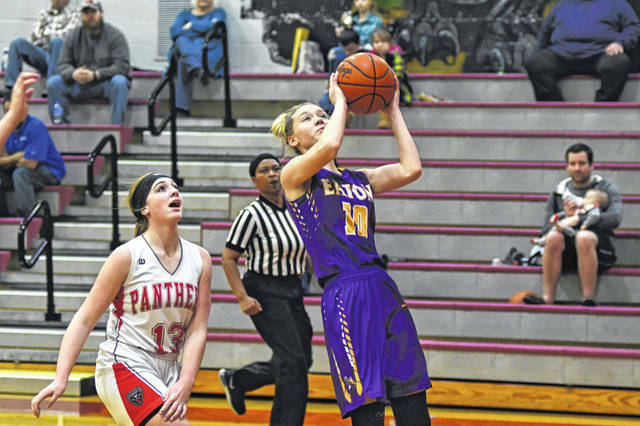 Eaton was scheduled to play at Monroe on Monday to close out the regular season. They will begin sectional tournament play on Saturday, Feb. 16 against Ponitz. The game is scheduled to begin at 2 p.m. and will be played at Springfield High School. 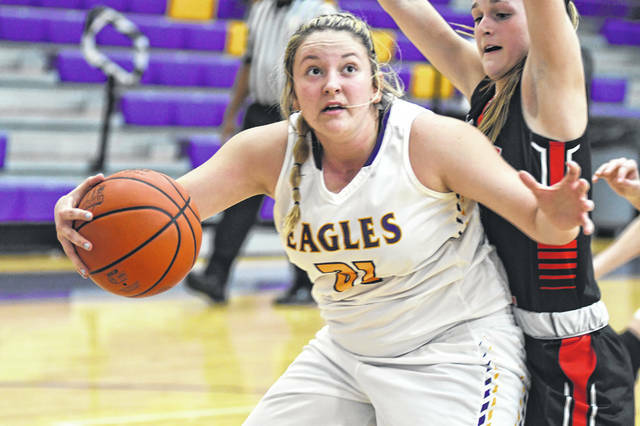 https://www.registerherald.com/wp-content/uploads/sites/41/2019/02/web1_ehsgbk8.jpgEaton sophomore Kylee Kidwell brings the ball up court during the Eagles basketball game at Tri-County North on Monday, Feb. 4. 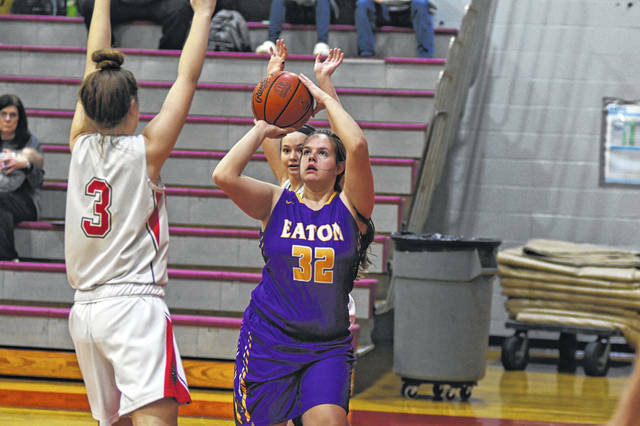 Eaton pulled away in the second half for a 56-35 win.